How will Artificial Intelligence (AI) impact industries and economies? How can governments and companies prepare for the 4th Industrial Revolution? ITU News recently spoke with renowned futurist Stephen Ibaraki to discuss the top trends shaping AI and ITU’s upcoming AI for Good Global Summit. Below are excerpts of the conversation. What are some of the big trends that you’re seeing in 2018 when it comes to advancements in AI? SI: The use of AI has really picked up. It used to be 40% adoption and it reached 50% in the last quarter of 2017. We got adoption across all industries and that is going to accelerate by 2018 onwards. In addition to that, we’re seeing AI applications being more widely distributed in terms of how developers can actually utilize or implement the technology. All the major vendors have tools that can be used using cloud services and so on. We’re going to see wider adoption with small and medium-sized businesses from a business standpoint. We’re also seeing a lot of applications being embedded into the computer chips themselves. In other words, the actual processors that are in all the devices around us will have AI capability embedded in those chips, which means we don’t have to have access to services like the Internet, it will be localized. We will then have adoption in areas where the infrastructure is still developing and that means a wider spread and application of AI. It’s predicted that there will be up to a $16 trillion increase by 2030 to the overall GDP of countries and, as a minimum, close to about 6%, with some countries like China leading the way with 20%, increase in GDP due to the application of AI. Those are some of the implications in terms of adoption of AI or the spread of AI and the impact it’s going to have on the economies of the world. We also have a situation with quantum computing. Some of the technology that was predicted to be more commercial application 50 years from now, we have Microsoft, Google and IBM working on it. This year we may see some early signs of quantum supremacy, that is where quantum computing exceeds the capability of standard classic computers that have been around for decades. There are also going to be applications of quantum computing and to AI applications where we could get 1,000 or 10,000 times increase in capability and that will mean a lot in terms of the application of AI worldwide. We’re seeing AI being integrated into other kinds of technology like augmented and virtual reality. We’re also seeing adoption of AI in the robotics space as robots are becoming increasingly more intelligent and capable. It’s about a $100 billion industry today and it will be over $200 billion in a few years, and that’s a combination of robots and drones where we’re going to also see AI capability embedded. What are some of the ways that AI can be used to help achieve the UN Sustainable Development Goals (SDGs) and for social and economic growth? SI: Whatever the SDGs are, whether it’s gender equality or poverty, for example, satellite imagery can be used to help determine where there are areas of resource restriction and we can have better resource allocation in terms of addressing poverty. There are countless ways that AI can be applied to healthcare, whether it’s in the diagnostic side, monitoring or assisting physicians by augmenting their capabilities and providing more accurate readouts and x-rays or other kinds of imaging required. AI can be used in the phones that we have, in the devices and wearables that are being widely distributed throughout the planet, which means that we can be monitoring for healthcare status and making adjustments. Food and sanitation as well, by increasing food production or helping in sanitation. Marine and land ecosystems where it can help in determining what are the optimum ways in which those ecosystems can be maintained and safeguarded. Industrial applications and infrastructure where factories can implement them. And in combination with things like blockchain technology and IoT, it will really bring the cost down to manufactured goods, increasing the quality and efficiency of these factories. Applications are so widespread it will hit every aspect, every one of the SDGs, and in a meaningful way. 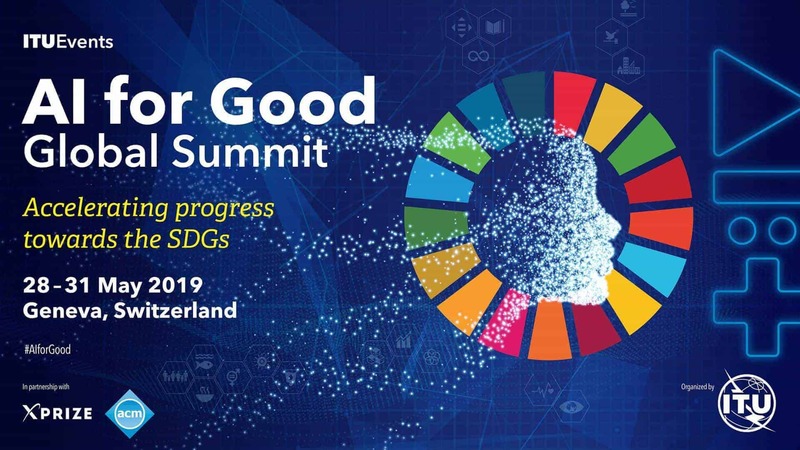 Building on the success of the AI for Good Global Summit last year, what can we expect and how will this year be different? SI: The Summit last year really was the most successful of its kind, bringing together over 20 UN organizations, over 40 global media with hundreds of audiences reached through social media as well, and bringing the top minds of the world, whether it’s in industry, government or research. This year, we have more interest and all of that is accelerating. Even more UN organizations are signed up, close to 30. Sponsors, in terms of contributing and financing, are way ahead of last year. We also have the world’s largest academic organization, in fact it’s the world’s largest scientific and educational computing society called the Association for Computing Machinery, the top-ranked computer science organization in the world. Also, XPRIZE, well-known for the different kinds of prizes they put out. In all of those measures that we had last year we’re now even further ahead. This year there’s also a focus on the implementation of AI, how can it be used in a meaningful way, what are some of the use cases, how can resources be applied to it and how can we track the application of AI to meet the SDGs, whether it’s with the application of smart cities, healthcare or satellite imagery. Compared to last year, which was more of a generalized discussion, this year it’s really focused on implementation and on how we can get meaningful results from it.